In this panel placed buttons which used very frequently at recording and editing patterns. Click "Hotkeys" button to open panel, next click closes it. Buttons "Stop all" and "Play pattern" are the same as buttons in "Transport" mode. 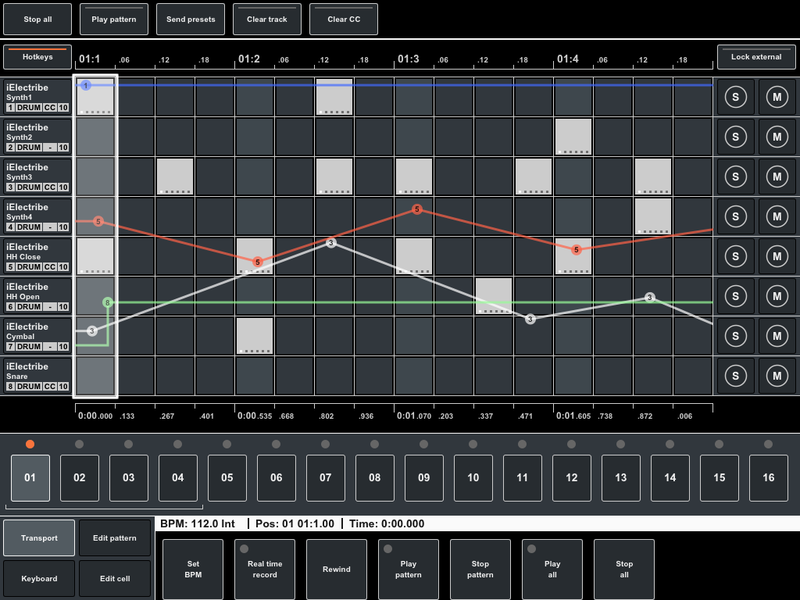 Button "Send presets" will immediately sends MIDI presets (if defined) for all patterns. Buttons "Clear track" and "Clear CC" clear all events in current track and all automation points (but not settings) in current track. These buttons are convenient to use at real time recording when need to rewrite entire track. These buttons are available in all modes except "Transport" (where current track not specified). 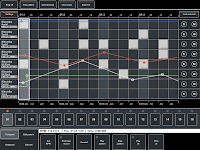 In other modes the current track is specified by the cell pointer or track pointer. Hint: To prevent accidental clearing all events these buttons needs click twice. The first time you click the button indicator is lights up. If you accidentally clicked the button, click "Hotkeys" to close panel and reset this mode. A second click on the button will perform clearing track. This button locks the changes pattern events and automations from the external MIDI input (from external devices or application). But keep sending MIDI messages from input to output if "Echo back" mode is on.